Dubai, UAE, January 28, 2019: When the most famous calibre in watchmaking is adorned with High Jewellery lacework gem setting, the result sheds new light on the architecture of the baguette movement. It will soon be 40 years old. But the best is yet to come. Beyond its men's and women's models, its manual or automatic winding, its vertical or horizontal structure, there is still no shortage of pages left to be written about the baguette movement. The Golden Bridge Round 39 is a perfect example. It is probably one of the most daring High Jewellery creations, not only for Corum but for contemporary watchmaking. The Golden Bridge Round 39's unique architecture features an exquisite interplay of shapes with its horizontal baguette movement and a half-moon on each side of a round 39 mm case. No fewer than six new High Jewellery versions are being unveiled today. Together, they highlight five exceptional stones: diamond, sapphire, ruby, tsavorite and amethyst. These stones are set in a genuine gold lacework that extends across the movement. Unlike most jewellery creations, with the Golden Bridge Round 39, light thus comes from within the piece. It illuminates the movement with glints of blue, green, red, purple and white. The baguette movement is the central element and core identity of any Golden Bridge, and the entire composition of the Round 39 model has been designed to showcase it once again. To do so, a lacework microstructure has been stretched out alongside the movement, which is home to gem setting requiring a day and a half of work. To accentuate the dial's radiance, Corum's artisans have chosen a marquise cut for the stones, giving the impression that rays of light are emanating from the movement and radiating out toward the case. Finally, the openwork character of the jewellery lacework allows light to literally cross through the piece. Each stone sparkles differently, depending on the angle, nature and intensity of the light that is cast on it, meaning that the Golden Bridge Round 39 never looks quite the same throughout the day. As with any High Jewellery piece, the Golden Bridge Round 39, offered in white gold and pink gold, is entirely paved (dial, bezel and horns). 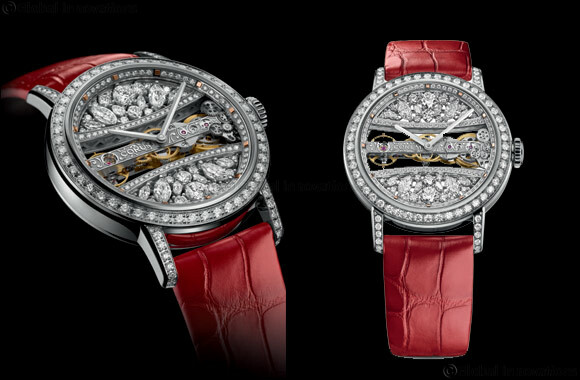 The diamond version has a final particularity: the two gold bridges that frame its baguette movement are paved with diamonds, as is the flange. These versions feature 76 Wesselton diamonds on the case, 12 marquise-cut diamonds and 24 round-cut diamonds on the microstructure, as well as 46 round-cut diamonds on the bridges of the microstructure and 60 diamonds on the flange, for a total of 6.41 carats. The success of the Golden Bridge Round 39 comes down to one thing: it honours the airy and light character of the baguette movement. Precious stones should serve an exceptional mechanism. And that is exactly the case with the Golden Bridge Round 39, which is the perfect combination of watchmaking and high jewellery.